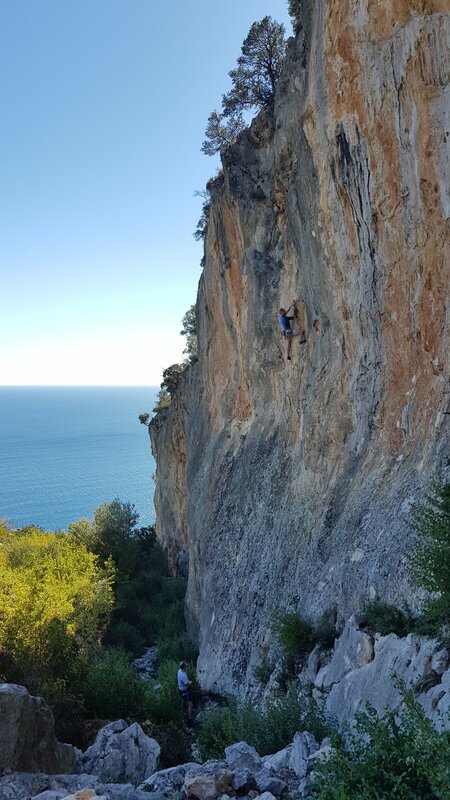 Leonidio has reached the attention of the wider climbing community over the past year or so and been touted as “the next Kalymnos”. 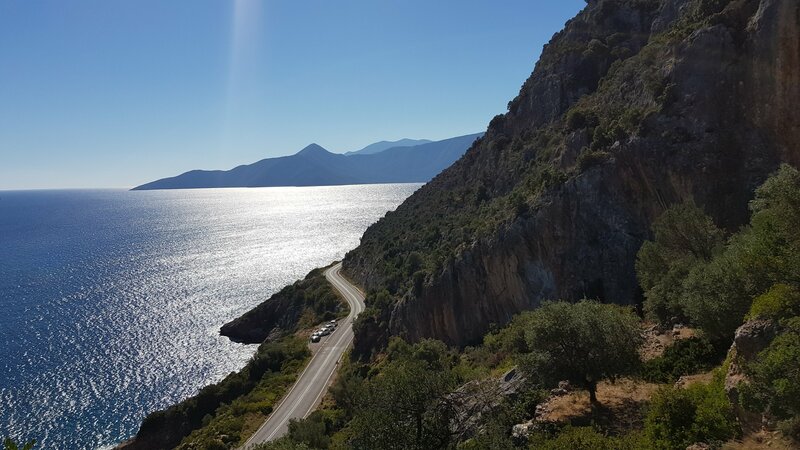 It’s around 4 hours south of Athens (initially on speedy motorway but soon giving way to winding country roads then spectacular coastal wiggling for the last couple of hours), around half way down the east coast of the Peloponnese. 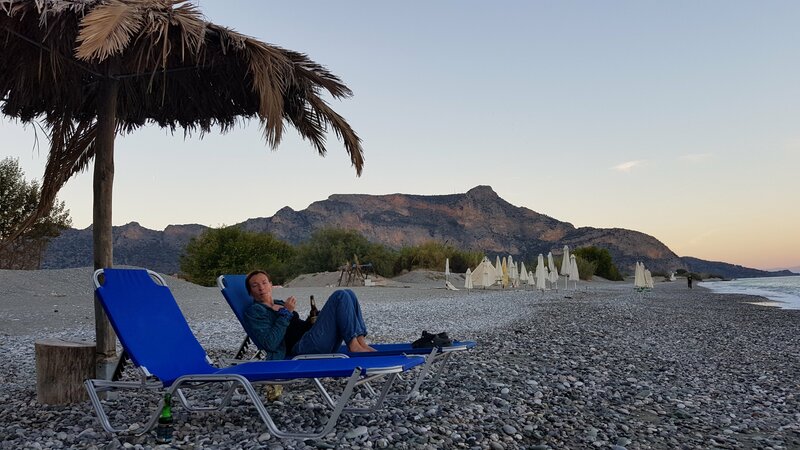 We arrived late into the evening at the very friendly Camping Semeli and settled into a spot next to the sea to be lulled to sleep by the sounds of crashing waves. 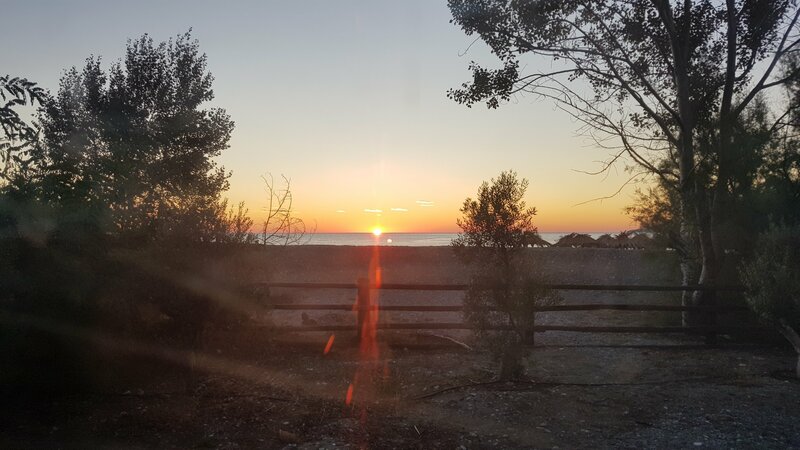 We woke, coincidentally, just as the sun was about to make its appearance above the horizon – here’s the view out of our bedroom window. 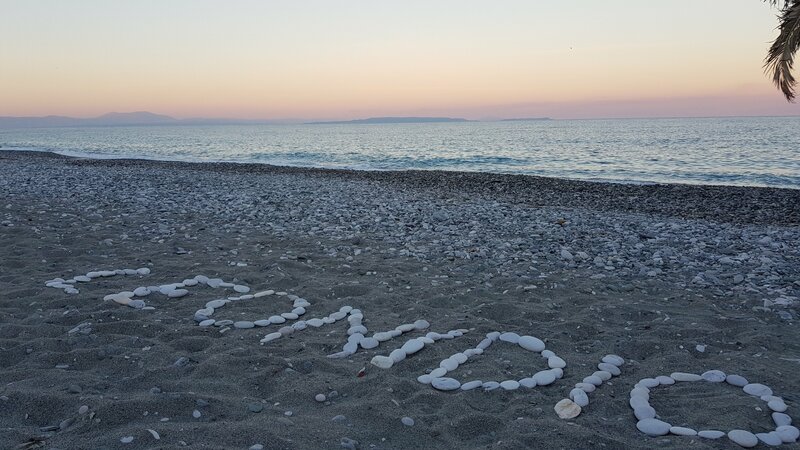 It’s certainly an impressive spot – the village of Leonidio is backed by a few miles of towering red cliffs giving a huge potential for future development. As it is, there are already over a thousand routes which have been put on on a “Kalymnos-model”, initially funded as an eco-tourism project with further support from the local community and visiting climbers, there’s a real feeling of welcome for the recent invasion of colourfully clothed foreigners. 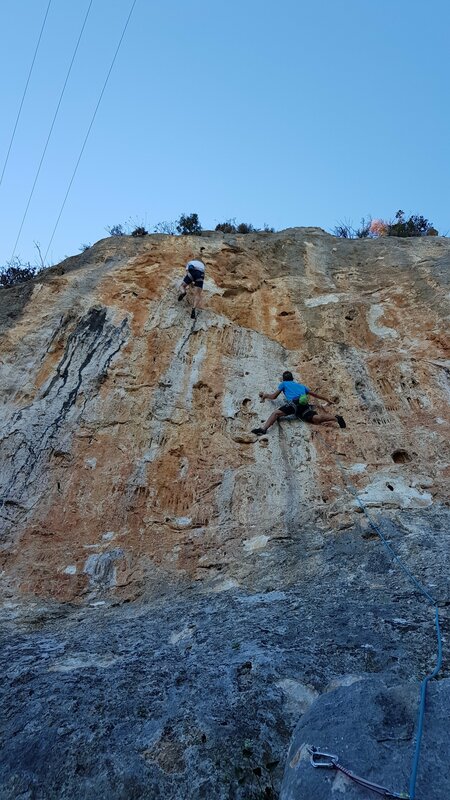 The majority of the climbing is on the south facing walls which act as a huge solar concentrator and wind break, making a perfect winter sunrock destination but a wee bit sweaty in an unseasonably warm mid October. It’s been in a the mid to high 20s for a couple of weeks now and forecast to remain so for the foreseeable future. 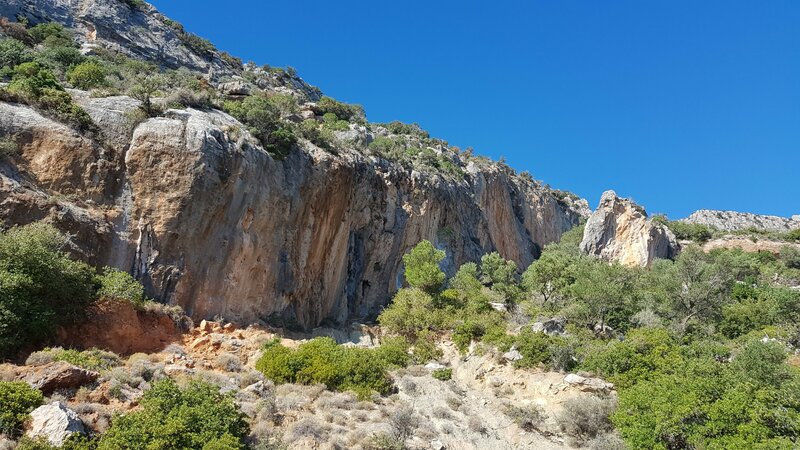 Shady crags are at a premium, so it was no surprise that we were joined at the newly developed Sabaton sector by quite a few other climbers. So new, it isn’t even in the 2016 guide, there’s still plenty of evidence of route cleaning activities and it will all take a while to fully settle down. Quite a lot of scrattly rock and a few crumbly holds – it pays to choose your route carefully (we probably should have steered clear of “Biskota” which had the consistency of a hobnob! 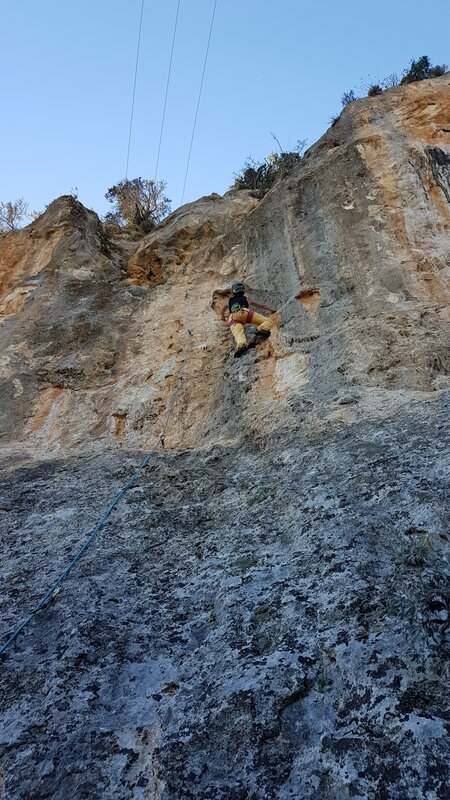 And me on Angel Low, 6b+, with a really fun and technical extension including a blind “pop” for what you have to assume will be a jug (and is 🙂 ) to give a 7a tick. A few more routes then a beer on the beach followed by a short wander to the tiny port of Plaka for grilled fish and salad. I’m feeling we might get to like Leonidio.